Pow Wows are the Native American people’s way of meeting together, to join in dancing, singing, visiting, renewing old friendships, and making new ones. This is a time method to renew Native American culture and preserve the rich heritage of American Indians. at Lark Community Center on Saturday ,Oct. 27, 2018, in McAllen. Slowly and in unison, they beat the ceremonial drum, each holding a single handmade drumstick. Within minutes, the tapping grew to a thundering cadence that could be heard well outside the community center walls. 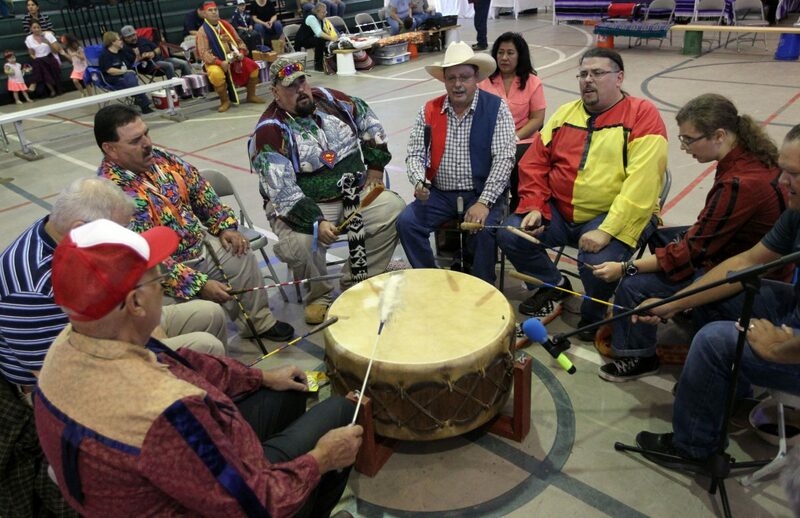 Such pomp meant the 48th annual Pow Wow was underway at the Lark Community Center in McAllen on Saturday, and taking center stage for the day-long religious and cultural festivities were members of the Lipan Apache tribe of Texas. Those who attended included a mix of individuals present to observe the celebration of the tribe’s culture, and those curious about its current place in the region. “I’m here because I want to learn more about the Indians that still live here,” said 8-year-old Cub Scout Peter Hollinger, one of dozens who attended the Pow Wow. George Villarreal of McAllen representing Chiricahua Apache during the 48th Annual Dak'ee Si Pow Wow at Lark Community Center on Saturday ,Oct. 27, 2018, in McAllen. Gourd Dancers during the 48th Annual Dak'ee Si Pow Wow at Lark Community Center on Saturday ,Oct. 27, 2018, in McAllen. The event is organized by the tribe, of which there are more than 4,000 members who reside throughout Texas, including the Rio Grande Valley. 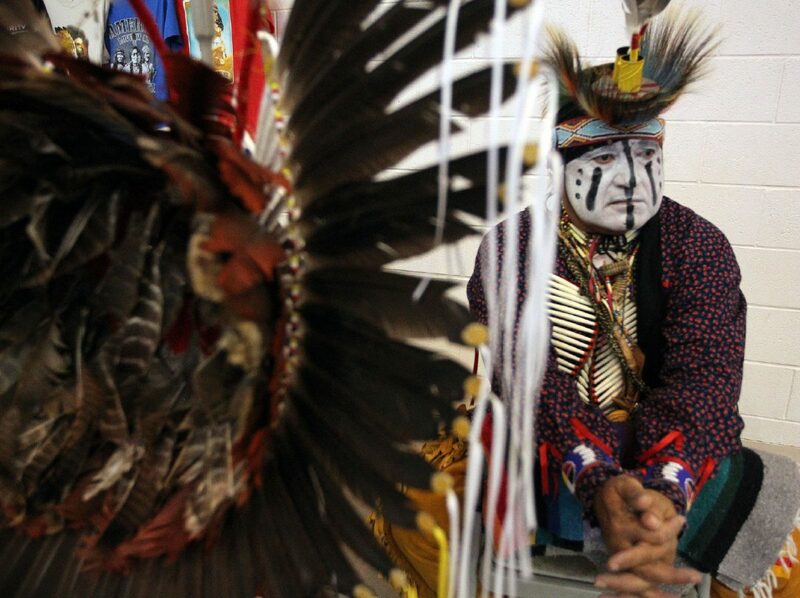 Robert Soto has organized the Pow Wow in the Valley for more than four decades. He said Lipan Apaches once stretched from San Antonio to Mexico City. His goal is to preserve the tribe’s rich heritage and share its cherished traditions. “I want people to know that Apache Indians are not in a museum; we’re still alive, and we’re still active,” said Soto. 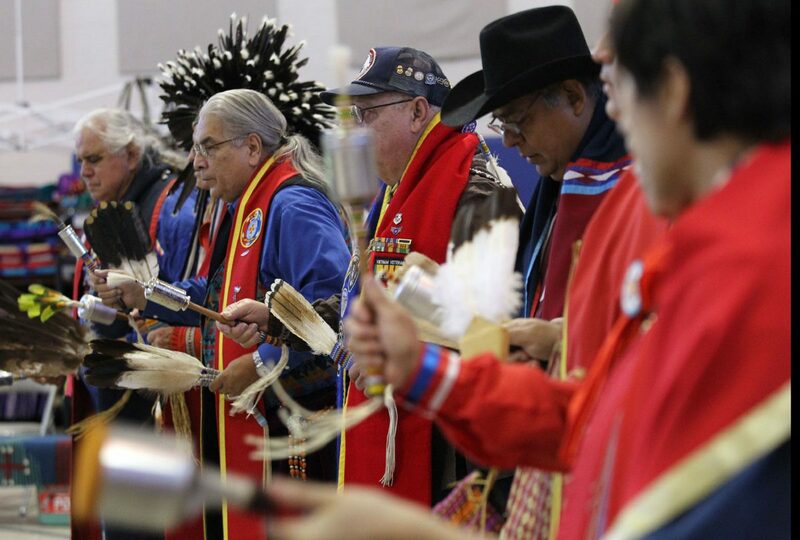 Saturday’s Pow Wow began as 10 tribal members sat in a drum circle. As the cadence roared, tribal members sang prayers. “They’re singing a song to the creator to bring peace to all the world,” said chief tribal dancer, Milo Colton of San Antonio. Moments later, tribal spectators drop dollar bills in front of his buckskin moccasins. The money was collected and divided between the 10 members of the drum circle. One onlooker waited a year to attend the Pow Wow. McAllen resident Norma Flores sat in the auditorium and enjoyed the festivities. Valley residents of all ages attended the event. Damian Cantu was there with his 8-year-old daughter, Natasha. But Natasha was there for a more mystical reason: to gaze upon an item popular among Native American artifacts — a dreamcatcher. “Whenever you’re sleeping, the good dreams go in your head and the bad dreams go in the hole,” said Natasha. Traditionally, a dreamcatcher is a Native American amulet used to comfort a child suffering from nightmares. The dreamcatcher is made by forming a circle from a willow tree branch and creating a web-like design woven through the ring. For years, the Pow Wow was in danger of violating federal law and being forced to shut down. 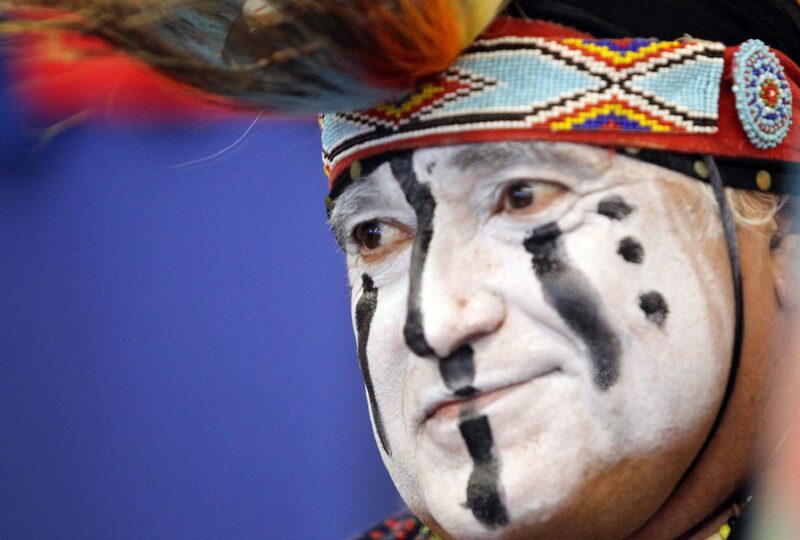 In addition to serving as the tribe’s chief dancer, Milo Colton also serves as the tribe’s attorney. He said the Lipan Apache nation was threatened with stiff fines and jail time for using eagle feathers as part of their ceremony. Colton said the tribe waged an 11-year battle and was victorious in federal court. The issue revolved around the fact that the tribe is not federally recognized. According to the U.S. Census, two-thirds of all Native Americans are not members of federally recognized tribes. Chris Hinojosa, who helps organize the annual Pow Wow, said that in addition to spreading awareness of Apache culture, the event attracts members of other tribes. “It brings people of different Indian tribes together and we can dance together and get to know each other other. Over time, we go from aquaintences, to friends, to becoming a family,” said Hinojosa. He said portions of the Pow Wow are considered sacred. Other portions are not. “Yes, the drum circle itself is sacred. Yes, you can say that. But only the circle is sacred,” said Hinojosa. He sees the event as an important step in preserving Native American culture for future generations. On March 18, 2009, Texas recognized “the historical and continued presence” of the Lipan Apache community in the state. Also in 2009, a representative of the Lipan Apache tribe met with President Barack Obama to petition for federal recognition.